Discussion in 'Rifles, Bullets, Barrels & Ballistics' started by Fiftydriver, Sep 11, 2004. If I remember correctly, this is exactly the same thing as the 257 STW except that someone is trying to put their name on the round and claim it as their design. Like most velocities in articles like this, I suspect there is a little bit of creative advertising envolved to churn up business for this riflebuilder. I have built several of these rifles, I engrave my barrels as 257 STW because that is what it is. In a 28" barrel this is an honest 4050-4100 fps rifle depending on rifling design and throat design and what bullet is used. I would have to honestly say he is pushing the envelope in pressure to get these velocities in a 26" pipe, but it sure do sound good!!! Skeeter is getting just shy of 3900 fps with his STW in a 26" Shilen barrel I believe, this is on par with what I have seen in conventional 6 and 8 groove barrels. THe 3 adn 4 groove barrels are getting about 50 fps more. The solid copper bullet from Lost River ballistic they refer to is also another red flag in my opinion that they are either running pressures very high or they are flat out exaggerating the velocity of this bullet. From what I have seen from these bullets, they get about the same velocity as teh next weight up bullet in their caliber. Just like a traditional X bullet. For example, a 100 gr X bullet can be driven to just a tick faster then one can drive say a 115 gr conventional cup jacketed bullet. Plus, if you do not mind paying +$40 for a box of 50 bullets, and from what I have heard from other smiths is that they simply are not aaccurate at longer ranges. In my opinion, use either a 100 gr Partition or a 115 gr Ballistic Tip or partition and you will be fine. All in all, I would say this article is an advertisement for a rifle builder who is doing nothing different then many other smiths including myself. He just seems to think he can get his name on a wildcat just because. Its a hell of a round, if you want those velocities though, I highly recommend a 28" barrel. My personal barrel will be here nect week for my new 257 STW. It is a stainless #6 contour, 30" Lilja with a 3 groove rifling design. With top loads I know this barrel will run a 100 gr bullet at very near 4200 fps but I will load it to the standard 4050-4100 fps level with lower pressures and longer throat life. 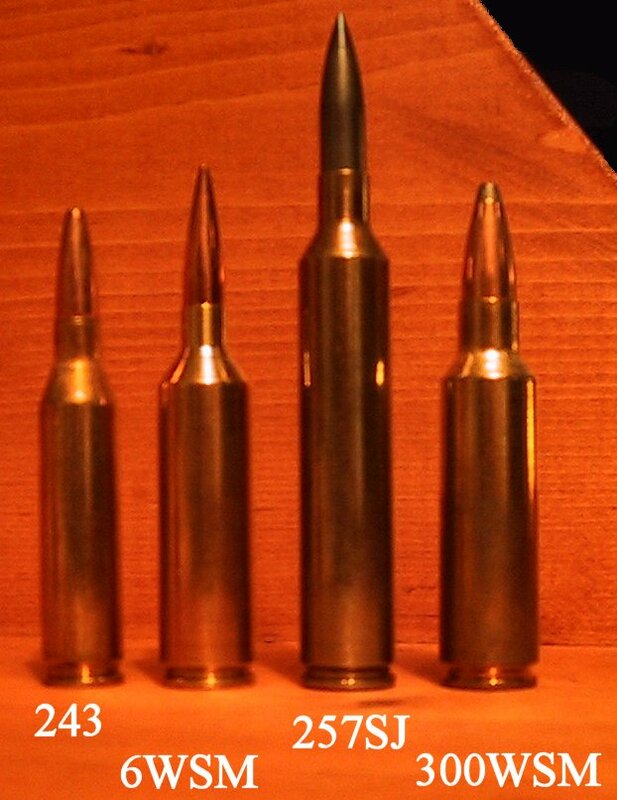 I will use the 100 gr pills for pronghorn and coyotes at long range and for deer I will probably move up to the 115 gr Ballistic Tip loaded to near 3800 fps. Richard Graves of Wildcat bullets is designing a 140 gr Rebated Boattail ULD bullet in .257" caliber and I will be testing those out for him in the big 257. This bullet may turn the 257 STW into a true +1000 yard rifle. You could get another 5gr capacity and no belt with the 6.53 Lazz Scramjet. Basically a near copy of the 257Banshee. with 85gr, and 115gr bullets with the 30 inch barrel? Can someone tell me what the ballistic difference is between the Hot Tamale and the Lazzeroni 6.53 Scramjet?? The Scramjet has been around for about 8 years now. It won't quite do what the Tamale is claimed to do but then I doubt if the Tamale will do it either without pounding both the brass and the rifle. C'mon fellas, there's nothing new here. Just hype. Forming cases is pretty easy the way I do it. What I do for my customer is have them buy a Redding Competition Bushing neck sizing die in 25-06. I then use teh same reamer to basically rechamber the sliding sleeve in the die and chamber it to the correct depth to allow a 7mm STW case to fit in it. Then all you have to do is buy the different size bushings and take a couple steps and neck the brass down with the one die by changins to smaller and smaller bushings until you are at the correct diameter. I designed my reamer so that you do not have to turn your case necks if you do not wish to. The neck of the reamer is 0.00175" over the diameter of a loaded 257 STW round using Win 7mm STW cases. This is a very quality fit. One should varify the thickness of your necks before shooting but on average, the Win brass is fine. YOu can still take a light 0.0005" pass on your necks if you want to true things up perfectly and you will still have a good snug neck. This reamer is not designed as a BR chamber, more as a BR/Hunting hybrid chamber to ge tthe most accurately safely from these high intensity rounds. In my opinion, the 85 gr pill is a poor choice for this round you will not get an efficent powder burn unless you go to a much faster powder and then you will get a low load density situation which can cause a variaty of problems. The 100 gr is as light as I recommend. THe 115 gr pills should easily get 3800 fps in the 30" Lilja 3 groove barrel. I do not know if I will drive them that hard but they should easily be able to do it. Richard Graves of Wildcat bullets in Alberta Canada is sending me some bonded core flat base 130 gr hunting bullets to try in the STW. I suspect I will be able to puch then to near 3600 fps. He is also sending me some prototype 140 gr Rebated boattails to test. Thats right a 140 gr bullet with a B.C. higher then a VLD design. I will be looking to get 3400 fps with these in the STW. THe 257 STW will get more velocity with the heavier bullets. The heavy bullets just help the very slow burning powders burn more efficently adn thus produce better velocities. The 115 gr class bullets and heavier are far better choices for the 257 STW on deer size game but velocity sells, sometimes at the expense of on game performance. Lazzeroni list his scramjet at 3750 fps with a 100 gr pill and he tends to be very optimistic about his velocities. How exactly is that out performing a 257 STW with a 100 gr bullet driven to 4000 fps? The Banshee is a ballistic twin to the STW, the Scramjet is basically in the same class as teh 257 Wby and nothing much more. Any why would you want to pay $40.00 per 20 rounds of brass when you can spend less then that and get 100 rounds of brass for the STW? The Scramjet, like many of Lazzeronis inventions, is over rates and lives more on myth then fact. I have also found his brass to be very poor quality, especially for what he thinks it is worth. My customers are getting in the 1000 to 1200 round life if they take good care of their barrel and use a high quality stainless barrel with a 3 or 4 groove rifling system. Also, a tight throat is a nessesity for any throat life at all with a round like this. If your smith uses a generic built solid piloted reamer to chamber your rifle, I would expect abotu 500-700 roudns of useful life. I designed my reamer with a throat 0.0002" over bullet diameter and this greatly reduces gas blowby and greatly saves on throat erosion. The STW and Banshee are the two biggest 257 rounds that I feel are useful and provide a long enough throat life to justify building a rifle in. I played around with the idea of a 257 RUM but computer models showed hardly any increase in velocity with available powders. Please call it a 257 STW because this Ferguson had nothing to do with designing the round. THe 257 STW is actually a substantial step up in power over teh Scramjet, in fact a solid 250 fps faster. This makes the 257 STW head and shoulders above the 6.53 in all catagories. I assure you that the 257 STW will do 4050 to 4100 fps in a 28" barrel without developing any more pressure then a factory loaded 257 Wby round. Now getting or claiming this velocity in a 26" barrel, I would agree with your last comment. The Lazzeroni stuff is alot of hype, the 257 STW is for real I promise you. I'am neck sizing my brass down with a .257 stw RCBS die.The FPS i'am getting is the most i can get and be safe.As of right now i have about 14 rounds loaded @ 80.5 grains and thats what i'am using for deer hunting this year.But after these rounds are gone i'am going to the 81.0 grains for the little extra speed. I got the idear of getting a.257 stw from reading the same article as you did about James Ferguson rifles. I called him and talked to him about 6 months ago about building me a rifle.He told me what die to get and it would take 3 to 4 months and it would cost about $3800. That was to much for me. Then i call Lost river tec. and ask about there bullets.I learded two 3 things.! They know James Ferguson VERY well.2 There bullet have nichel chrome in them and have a B.C. of about .530 . 3 they are about $36.00 for a box of 20. I got my rifle built for about $500.00 and i have spent a lot of time with it pulling out my hair.I got it like i want it, but at the start i had a lot of unasnswered questions.If i could go back ,the way kirby Allen builds his rifles,and what i read about the way he necks down brass and ect. He would have built mine. If theres anything wrong with the way i have done things in this artilc that i have talked about .OLD kirby Allen will let us know.I have posted what i think about him so if need to know something ask Kirby. .257 stw owners look at those pics and see if it looks like your case or is it improved?I cant tell. Anyway he claims 4060fps with a 100gr bullet 26inch barrel. Thats correct. The STW is smaller than the Scramjet. And if any brass on earth could be pushed in pressure, it's Lazzeroni brass. QL shows the scramjet as having more capacity(2.5gr more), however I drew up both quick in RCBS load, and it looks more like 5gr to me. Now this assumes that the STW was simply necked down and not improved. The SJ I was building was 40deg at the shoulder, w/less body taper(like the Banshee), and nothing out there would have touched it. In fact, the rifle is still being built by PGW. But I've decided not to use it(will sell). The 257WBY is a full 20gr below the Scramjet. You're right Mike. The Lazz is some of the strongest brass made. A SJ case weighs about 15% more than an STW even though the internal volume is only 2% more. And the quality is as good as Remchester IMHO. The 7 STW, when it was adopted by SAAMI, was nothing new. Guys had been necking down the Rem 8MM Mag ever since brass became available in 1979. Before that they were using 300 WBY and 375 H&H brass. There are probably many shooters who were playing with their own version of the 257 STW for 50 years or more. I've been wildcatting for quite a few years myself and if there's one thing I've learned it's that there is nothing new. Both are well beyond diminished returns. Mine will be a light(titanium/carbon fiber) deer rifle. If I ever use it, won't be much. Winchester model 70 300 win mag.